One of the great things to come out of the various meetings over the last month were connections with wonderful people who could see the potential for this work to really have an impact. Two of those people were Sarandeep and Aparna who run the Women’s Empowerment and Entrepreneurship (WEE) Foundation from IIT Delhi. We met in Ranchi at the TEDx event where they were both speaking on various aspects of their work with women and empowerment. Sarandeep and I arrived on the same flight from Delhi to Ranchi, and connected in the taxi to the hotel. It was clear that we had interests in common, and when our speaking engagements were done the next day, we went our separate ways with a promise to stay in touch and work together in the future. I didn’t know it would be so soon. After Ranchi I flew to Mumbai and together with Nitisha we did a round of meetings and media, and somehow we were noticed by Viacom, who wanted to film one of our workshops for their Colors Infinity Channel who are launching the Shark Tank program in India… and they specifically wanted me to be running the workshop and they needed the footage soon. 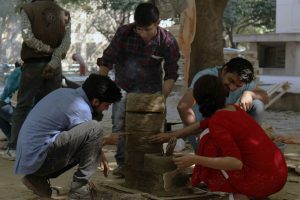 It’s a long and curious web of connectivity, but since I only had a few days left in India on my current visa, and we weren’t planning a workshop in that period, I decided to ask Sarandeep if we could put something together at IIT Delhi (Indian Institute of Technology) at short notice. To his credit, he immediately got engaged and cleared a path so that together with Tanzin we could run a hands-on practical workshop on the grounds of the campus, as well as giving us access to a lecture hall to do the theory component of the workshop. 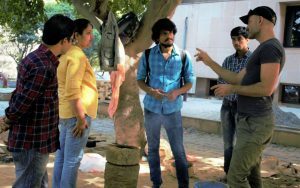 All the necessary permissions were arranged, and Viacom organised to have their film crew onsite for both days over the weekend of the workshop. 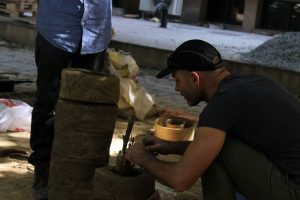 Tanzin came down the day before to prepare the materials and to make some clay donuts in advance. In the 2 day version of the workshop, the thing that takes the most time is allowing the clay donuts to dry so we can use them for the cook stoves. Tanzin worked his magic, as always, and found all the ingredients we needed and made the donuts on Friday. Saturday midday I started the workshop with the small group who turned up to learn the magic of smokeless fire by showing a short video of the process and talking through the theory of how it all works. By Saturday afternoon, after a quick lunch break, we were having fun mixing the rest of the clay and forming donuts while Tanzin was putting the finishing touches on the demonstration chulha. We agreed that for Sunday we would need to be making chai on the chulha, and I’m happy to say that 2 of our group brought all the required ingredients so we were indeed making chai (and proving the effectiveness of smokeless fire) the next day. With just a few sticks and twigs that were lying about on the ground, we fired up the demonstration chulha and were happily making chai on a (relatively) smokeless cook stove. It had yet to fully dry and cure, so there were occasional puffs of smoke as the internals got hot enough to burn out the bio matter we had mixed into the clay, but sure enough, a bit later in the day after it had run for a few hours, it was burning clean and hot. Tanzin did his trick of holding a piece of aluminium into the flame and we all watched as it quickly melted and burnt away. That shows the temperature was well over 750C inside the stove, hot enough to burn smoke. The simple magic of adding rice puffs to the clay along with a design that maximises airflow, proved again how easily and cheaply we could make smokeless fire that would reduce the impact of Household Air Pollution (HAP) on the staggering numbers of people who still depend on rudimentary fire for cooking. According to the World Health Organisation there are 3 billion people still reliant on basic fire or rudimentary unventilated cook stoves around the world. Around 800 million suffer from poor health, and over 4 million people die from indoor pollution related causes each year, usually women and children who spend the most time in the kitchen.